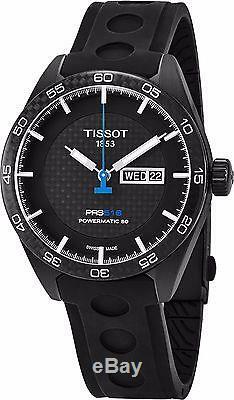 Tissot Men's PRS 516 Black Dial Rubber Strap Powermatic 80 Watch T1004303720100. Case: Brushed and polished black PVD coated stainless steel. 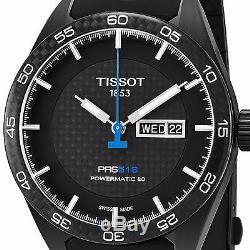 Bezel: Black carbon fiber, tachymeter scale inscribed. Dial: Black, with carbon fiber in the center. Hands: Silvertone, luminescent (with blue second hand). Calendar: Date and day of the week display window at the 3 o'clock position. Water resistance: 10 ATM/100 meters/330 feet. Case measurements: 42 mm in diameter x 12.5 mm thick. Strap measurements: 20 mm wide x 8 inches long. Box measurements: 6 inches wide x 6 inches long x 5 inches high. Model: T100.430.37.201.00. All measurements are approximate and may vary slightly from the listed dimensions. Automatic movement winds with the movement of your arm. It is recommended that you wind the watch every two weeks. 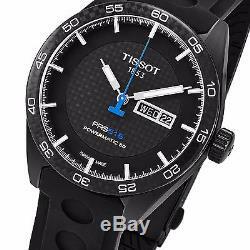 The item "Tissot Men's PRS 516 Black Dial Rubber Strap Powermatic 80 Watch T1004303720100" is in sale since Thursday, May 18, 2017. This item is in the category "Jewelry & Watches\Watches, Parts & Accessories\Wristwatches". The seller is "sigmatime" and is located in Brooklyn, New York.